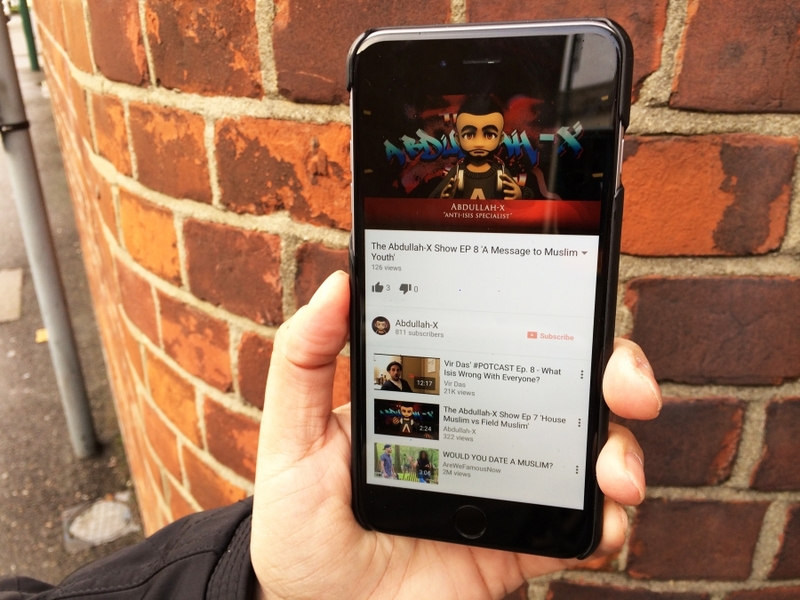 The creator of the Abdullah-X cartoon holds up his cell phone, showing an image of the character who speaks to Muslim youth about issues such as extremism, the teachings of Islam and the challenges of being young and Muslim. "The Abdullah-X Show" is a YouTube program that seeks to provide young Muslims with a counter-narrative to extremist ideology and propaganda. Abdullah-X is a cartoon character who speaks with the accent of a working class Londoner. But this bearded, honey-hued Muslim millennial also talks about crucial issues of the day — like Jihad, the Muslim identity, Islamophobia and terrorism — with a bit of an attitude. "If you can&apos;t tell when you&apos;re sold propaganda, then you run the risk of becoming propaganda yourself," he says in one video. "Have you not found a more constructive way to support the innocent people of Syria compared to trying to go out there and fight there to simulate some video game that you feel you have to enact in real life?" he asks in another segment. In the most recent video posted on Dec. 17, titled "Trump and the Daeshbags," he says: "Just when I thought my job here was done, the world goes on and gives me Trump." "The Abdullah-X Show" on YouTube is the creation of a former Islamic extremist who says he was attracted precisely to the kind of ideology terrorists espouse these days. He asked to remain anonymous out of concerns for his safety. The man, who today lives in east London, knows that today&apos;s extremists aren&apos;t preaching from a pulpit, in a park or at a street corner, but gaining direct access into living rooms and bedrooms through social media sites. For a little over two years now, the creator of Abdullah-X has tried to provide a counter-narrative to the massive ISIS propaganda machine online, which bombards youth with its narrative of violence — using anything from cooking channels to its own version of the Grand Theft Auto video game. In the summer of 2014, an Abdullah-X video titled "Five Considerations for a Muslim on Syria," got a 5,000-word response from an ISIS operative, a seemingly desperate effort to challenge the counter-narrative. More than 60,000 people viewed that video. "For a project such as Abdullah-X, which is avant-garde and pretty nuanced, those aren&apos;t bad metrics," he said. "We&apos;re not assuming that this is about reaching masses of people because masses aren&apos;t vulnerable to these issues. "But if one young man who suddenly sees an Abdullah-X advert flash across his screen and clicks on it, it might just save him a plane ticket." News of Abdullah-X&apos;s success reached the White House in February during its Summit on Countering Violent Extremism. During this summit, President Barack Obama talked about the significant role former extremists can play in countering terrorism. Abdullah-X&apos;s creator has felt energized not just by the encouragement from the president, but also from the powerful reaction his cartoon character managed to get from ISIS. "The fact is that one of the most powerful terrorist organizations in the world felt the need to respond to a cartoon character," he said. "The point of Abdullah-X is to plant the seed of critical thinking in the minds of young people who are out there, believing that Google is God." He wasn&apos;t happy with the way he looked, where he was and how he was treated. So, the way into extremist networks was "fairly simple" for the man who created Abdullah-X. His purpose in life at the time was to "gain the pleasure of Allah." And that meant limiting his parents&apos; influence on him, becoming more withdrawn, keeping quiet about what he was learning and slowly taking on a politicized mantra. "Eventually, that narrative led me to bring out all the pent up anger that I had about myself and I tried to cast that stone on everyone else," he said. He became an "entry-level recruiter" for Islamic extremist networks in London. He was most active with candidates between the ages of 16 and 29. He hung around college cafeterias and became good at spotting others like him — bitter, angry and lacking in confidence. "My job was to bring them into the ideology and then move them along." Some of the men he recruited went on to commit violent acts. The extremist networks to which he brought fresh recruits served as "shopping windows for terrorist groups," he said. While the way in was easy, the way out was long, painful and complicated, he said. It was not an epiphany, but a gradual thought process spread over three years that showed him the exit, he recalls. The turning point came when he realized how his ideology had turned his own neighbors into his enemies and how far he had strayed from the true teachings of Islam. "I realized I&apos;d become a pawn in someone else&apos;s chess game," he said. "And I&apos;d always dreamed of being a knight." Now, as a former extremist who is fighting the very ideology he once preached, the creator of Abdullah-X knows that between then and now, the terrorists&apos; narratives haven&apos;t changed. "If you&apos;ve been one of those people, you actually know exactly what they want to achieve and how they want to achieve it," he said. "So, I&apos;m not afraid to put out content that young people definitely need to hear." He also interacts "offline" with young people in schools and colleges, identifying himself as a former extremist, having conversations with youth about issues such as the true meaning of Jihad, the dangers of extremism and the backlash against Muslims after terrorist attacks, most recently in Paris and San Bernardino. "The stuff they are searching for on Google is often the same stuff they ask you about when you are standing before them in a classroom," he says. One question he often encounters: "Brother, is it OK to discuss jihad?" His answer: "It&apos;s OK, brother, as long as you know which jihad you&apos;re discussing." Jihad, he said, has become a dirty word in mainstream media. "I try to put out content that hopefully one day will bring us back to the true meaning of jihad, the greater jihad being one of self-struggle," he said. Grassroots efforts against extremism such as Abdullah-X, which use the media of animation, graphic novels, music and even video games, are much more powerful than posts on the US State Department&apos;s Twitter account, said London-based counter-terrorism expert Ross Frenett. "Government sites have that finger-wagging approach," he said. "But initiatives such as Abdullah-X are far more effective because they genuinely come from within the community and make an honest effort to speak the language of their target audience." Very little currently exists to fight ISIS&apos; propaganda machine online, said Daniel Kohler, director of the Berlin-based German Institute on Radicalization and De-radicalization Studies. "There are statistics showing that the Islamic State produces 30 to 40 Hollywood-quality videos every day and sends them out on social media," he said. "So, there is really very little out there to fight that kind of propaganda." Abdullah-X&apos;s creator plans to do more. He&apos;s already released "The Adventures of Abdullah-X: The Complete Graphic Novel." And he is getting ready to launch Muslima X, a character, who he hopes will be able to speak to young Muslim women who are drawn to radicalism. "Muslima X has superpowers," he said. "She can sense when people are turning toward hate and anger and she has two friends she has helped rescue from the allure of ISIS messaging." He hopes Abdullah-X will inspire other characters who will "carry on that flame of reason." "Because without reason, there is only madness," he said. Much of this work has helped him heal too. "One of the most transformative experiences I&apos;ve had is being brave enough and open enough to share my own good and bad experiences and why I got involved in extremism and why I got out of it," he said. "For me, the doing has become the healing." This story was produced with help from the International Women&apos;s Media Foundation through the Howard G. Buffett Fund for Women Journalists.